Optimizer Statistics Advisor analyzes how optimizer statistics are gathered, and then makes recommendations. Optimizer Statistics Advisor is built-in diagnostic software that analyzes the quality of statistics and statistics-related tasks. This section explains the basic workflow for using Optimizer Statistics Advisor. All procedures and functions are in the DBMS_STATS package. The advisor task runs automatically in the maintenance window, but you can also run it on demand. You can then view the advisor report. If the advisor makes recommendations, then in some cases you can run system-generated scripts to implement them. The following figure provides a conceptual overview of Optimizer Statistics Advisor. Description of "Figure 18-1 Optimizer Statistics Advisor"
Optimizer Statistics Advisor inspects how optimizer statistics are gathered. Optimizer Statistics Advisor uses the same advisor framework as Automatic Database Diagnostic Monitor (ADDM), SQL Performance Analyzer, and other advisors. Perform Optimizer Statistics Advisor tasks using the DBMS_STATS PL/SQL package. The advisor automatically diagnoses problems in the existing practices for gathering statistics. The advisor does not gather a new or alternative set of optimizer statistics. The output of the advisor is a report of findings and recommendations, which helps you follow best practices for gathering statistics. Optimizer statistics play a significant part in determining the execution plan for queries. Therefore, it is critical for the optimizer to gather and maintain accurate and up-to-date statistics. The optimizer provides the DBMS_STATS package, which evolves from release to release, for this purpose. Typically, users develop their own strategies for gathering statistics based on specific workloads, and then use homegrown scripts to implement these strategies. The advantage of the scripted approach is that the scripts are typically tested and reviewed. However, the owner of suboptimal legacy scripts may not change them for fear of causing plan changes. An advisor-based approach offers better scalability and maintainability than the traditional approach. Legacy scripts may not keep pace with new best practices, which can change from release to release. Frequently, successive releases add enhancements to histograms, sampling, workload monitoring, concurrency, and other optimizer-related features. For example, in Oracle Database 12c, Oracle recommends setting AUTO_SAMPLE_SIZE instead of a percentage. However, legacy scripts typically specify a sampling percentage, which may lead to suboptimal execution plans. Resources are wasted on unnecessary statistics gathering. A script may gather statistics multiple times each day on the same table. Automatic statistics gathering jobs do not guarantee accurate and up-to-date statistics. For example, sometimes the automatic statistics gathering job is not running because an initialization parameter combination disables it, or the job is terminated. Moreover, sometimes the automatic job maintenance window is insufficient because of resource constraints, or because too many objects require statistics collection. Jobs that stop running before gathering all statistics cause either no statistics or stale statistics for some objects, which can in turn cause suboptimal plans. Statistics can sometimes be missing, stale, or incorrect. For example, statistics may be inconsistent between a table and its index, or between tables with a primary key-foreign key relationship. Alternatively, a statistics gathering job may have been disabled by accident, or you may be unaware that a script has failed. Lack of knowledge of the problem can be time-consuming and resource-intensive. For example, a service request might seek a resolution to a problem, unaware that the problem is caused by suboptimal statistics. The diagnosis might require a great deal of time emailing scripts of the problematic queries, enabling traces, and investigating traces. Recommended fixes may not be feasible. Performance engineers may recommend changing the application code that maintains statistics. In some organizations, this requirement may be difficult or impossible to satisfy. If best practices change in a new release, then Optimizer Statistics Advisor encodes these practices in its rules. In this way, the advisor always provides the most up-to-date recommendations. The advisor analyzes how you are currently gathering statistics (using manual scripts, explicitly setting parameters, and so on), the effectiveness of existing statistics gathering jobs, and the quality of the gathered statistics. Optimizer Statistics Advisor does not gather a new or alternative set of optimizer statistics, and so does not affect the workload. Rather, Optimizer Statistics Advisor analyzes information stored in the data dictionary, and then stores the findings and recommendations in the database. The advisor applies rules to generate findings, recommendations, and actions. When you implement a recommended action, benefit accrues to every execution of the improved statements. For example, if you set a global preference so that the sample size is AUTO_SAMPLE_SIZE rather than a suboptimal percentage, then every plan based on the improved statistics can benefit from this change. For the automated job to run, the STATISTICS_LEVEL initialization parameter must be set to TYPICAL or ALL. The advisor integrates with SQL Tuning Advisor and AWR, which summarize the Optimizer Statistics Advisor results. The Optimizer Statistics Optimizer framework stores its metadata in data dictionary and dynamic performance views. 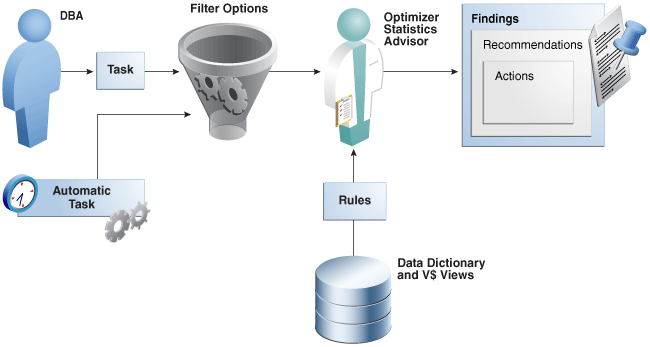 Optimizer Statistics Advisor supports both an automated and manual mode. The following Venn diagram shows the relationships among rules, findings, recommendations, and actions for Optimizer Statistics Advisor. For example, all findings are derived from rules, but not all rules generate findings. Description of "Figure 18-2 Optimizer Statistics Advisor Components"
An Optimizer Statistics Advisor rule is an Oracle-supplied standard by which Optimizer Statistics Advisor performs its checks. A finding results when Optimizer Statistics Advisor examines the evidence stored in the database and concludes that the rules were not followed. Based on each finding, Optimizer Statistics Advisor makes recommendations on how to achieve better statistics. An Optimizer Statistics Advisor action is a SQL or PL/SQL script that implements recommendations. When feasible, recommendations have corresponding actions. The advisor stores actions in DBA_ADVISOR_ACTIONS. The rules embody Oracle best practices based on the current feature set. If the best practices change from release to release, then the Optimizer Statistics Advisor rules also change. This class checks the preferences for statistics collection, status of the automated statistics gathering job, use of SQL plan directives, and so on. Rules in this class have the value SYSTEM in V$STATS_ADVISOR_RULES.RULE_TYPE. This class checks whether statistics collection uses the defaults, test statistics are created using the SET_*_STATS procedures, and so on. Rules in this class have the value OPERATION in V$STATS_ADVISOR_RULES.RULE_TYPE. This class checks for the quality of the statistics, staleness of statistics, unnecessary collection of statistics, and so on. Rules in this class have the value OBJECT in V$STATS_ADVISOR_RULES.RULE_TYPE. For example, one rule might specify the recommended setting for an initialization parameter. Another rule might specify that statistics should be gathered at the schema level. For example, the advisor may recommend that the maintenance window for the automatic statistics gathering job should be enabled, or that the window should be extended. For example, a rule might specify that default parameters should be used in DBMS_STATS, or that statistics should not be set manually. In V$STATS_ADVISOR_RULES, each rule has a unique string ID that is usable in the DBMS_STATS procedures and reports. You can use a rule filter to specify rules that Optimizer Statistics Advisor should check. However, you cannot write new rules. The following query, with sample output, lists a subset of the rules in V$STATS_ADVISOR_RULES. The rules may change from release to release. 8 UseDefaultParams                OPERATION Use Default Parameters in Statistics Collection Proc. To generate findings, Optimizer Statistics Advisor executes a task, which is invoked either automatically or manually. This task analyzes the statistics history stored in the data dictionary, the statistics operation log, and the current statistics footprint that exists in SYSAUX. For example, the advisor queries DBA_TAB_STATISTICS and DBA_IND_STATISTICS to determine whether statistics are stale, or whether a discrepancy exists between the numbers of rows. Typically, Optimizer Statistics Advisor generates a finding when a specific rule is not followed or is violated, although some findings—such as object staleness—provide only information. For example, a finding may show that DBMS_STATS.GATHER_TABLE_STATS has used ESTIMATE_PERCENT=>0.01, which violates the ESTIMATE_PERCENT=>AUTO_SAMPLE_SIZE rule. A finding corresponds to exactly one rule. However, a rule can generate many findings. For example, the advisor might discover a violation to the rule of not using sampling when gathering statistics, and recommend specifying AUTO_SAMPLE_SIZE instead. The advisor stores the recommendations in DBA_ADVISOR_RECOMMENDATIONS. Multiple recommendations may exist for a single finding. In this case, you must investigate to determine which recommendation to follow. Each recommendation includes one or more rationales that explain why Optimizer Statistics Advisor makes its recommendation. In some cases, findings may not generate recommendations. The advisor checks conformity to the rule that stale statistics should be avoided. The advisor discovers that a number of objects have no statistics. The advisor recommends gathering statistics on the objects with no statistics. The advisor generates a PL/SQL script that executes DBMS_STATS.GATHER_DATABASE_STATS, supplying a list of objects that need to have statistics gathered. The predefined task AUTO_STATS_ADVISOR_TASK runs automatically in the maintenance window once per day. The task runs as part of the automatic optimizer statistics collection client. The automated task generates findings and recommendations, but does not implement actions automatically. As for any other task, you can configure the automated task, and generate reports. If the report recommends actions, then you can implement the actions manually. You can create your own task using the DBMS_STATS.CREATE_ADVISOR_TASK function, and then run it at any time using the EXECUTE_ADVISOR_TASK procedure. Unlike the automated task, the manual task can implement actions automatically. Alternatively, you can configure the task to generate a PL/SQL script, which you can then run manually. "Configuring Automatic Optimizer Statistics Collection"
Creates an advisor task for Optimizer Statistics Advisor. If the task name is already specified, then the advisor uses the specified task name; otherwise, the advisor automatically generates a new task name. Deletes an Optimizer Statistics Advisor task and all its result data. Executes a previously created Optimizer Statistics Advisor task. Interrupts a currently executing Optimizer Statistics Advisor task. The task ends its operations as it would in a normal exit, enabling you to access intermediate results. You can resume the task later. Cancels an Optimizer Statistics Advisor task execution, and removes all intermediate results of the current execution. Resets an Optimizer Statistics Advisor task execution to its initial state. Call this procedure on a task that is not currently executing. Resumes the Optimizer Statistics Advisor task execution that was most recently interrupted. Reports the results of an Optimizer Statistics Advisor task. Generates a recommendation report on the given item. Configures the Optimizer Statistics Advisor lists for the execution, reporting, script generation, and implementation of an advisor task. Creates an operation filter for a statistics operation. Configures the rule filter for an Optimizer Statistics Advisor task. Configures the operation filter for an Optimizer Statistics Advisor task. Configures the object filter for an Optimizer Statistics Advisor task. Updates the value of an Optimizer Statistics Advisor task parameter. Valid parameters are TIME_LIMIT and OP_START_TIME. Gets the script that implements the recommended actions for the problems found by the advisor. You can check this script, and then choose which actions to execute. 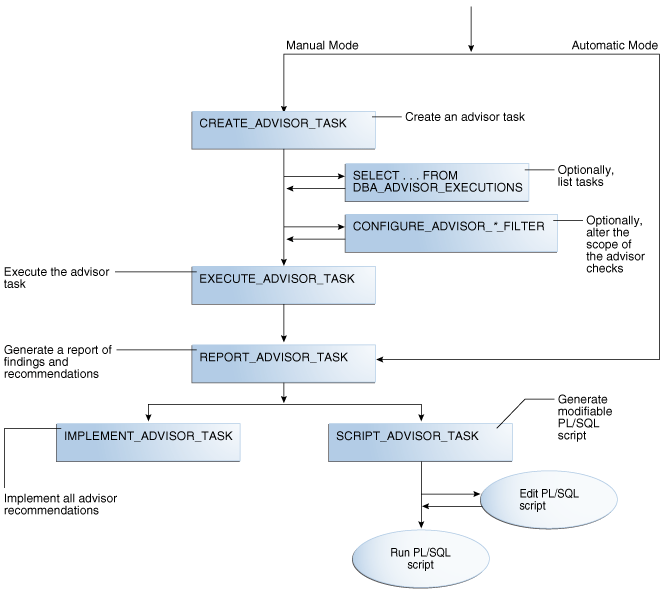 Implements the actions recommended by the advisor based on results from a specified Optimizer Statistics Advisor execution. The following figure shows the automatic and manual paths in the workflow. If AUTO_STATS_ADVISOR_TASK runs automatically in the maintenance window, then your workflow begins by querying the report. In the manual workflow, you must use PL/SQL to create and execute the tasks. Description of "Figure 18-3 Basic Tasks for Optimizer Statistics Advisor"
Typically, you perform Optimizer Statistics Advisor steps in the sequence shown in the following table. Create an Optimizer Advisor task using DBMS_STATS.CREATE_ADVISOR_TASK (manual workflow only). "Creating an Optimizer Statistics Advisor Task"
Optionally, list executions of advisor tasks by querying DBA_ADVISOR_EXECUTIONS. "Listing Optimizer Statistics Advisor Tasks"
Optionally, configure a filter for the task using the DBMS_STATS.CONFIGURE_ADVISOR_*_FILTER procedures. "Creating Filters for an Optimizer Advisor Task"
Execute the advisor task using DBMS_STATS.EXECUTE_ADVISOR_TASK (manual workflow only). "Executing an Optimizer Statistics Advisor Task"
"Generating a Report for an Optimizer Statistics Advisor Task"
Implement all recommendations automatically using DBMS_STATS.IMPLEMENT_ADVISOR_TASK. Generate a PL/SQL script that implements recommendations using DBMS_STATS.SCRIPT_ADVISOR_TASK, edit this script, and then run it manually. "Implementing Actions Recommended by Optimizer Statistics Advisor" and "Generating a Script Using Optimizer Statistics Advisor"
This script illustrates a basic Optimizer Statistics Advisor session. It creates a task, executes it, generates a report, and then implements the recommendations. The DBMS_STATS.CREATE_ADVISOR_TASK function creates a task for Optimizer Statistics Advisor. If you do not specify a task name, then Optimizer Statistics Advisor generates one automatically. The DBA_ADVISOR_EXECUTIONS view lists executions of Optimizer Statistics Advisor tasks. Filters enable you to include or exclude objects, rules, and operations from Optimizer Statistics Advisor tasks. The DBMS_STATS.EXECUTE_ADVISOR_TASK function executes a task for Optimizer Statistics Advisor. If you do not specify an execution name, then Optimizer Statistics Advisor generates one automatically. The DBMS_STATS.REPORT_ADVISOR_TASK function generates a report for an Optimizer Statistics Advisor task. You can either implement all recommendations automatically using DBMS_STATS.IMPLEMENT_ADVISOR_TASK, or generate an editable script using DBMS_STATS.SCRIPT_ADVISOR_TASK. To execute this subprogram, you must have the ADVISOR privilege. This subprogram executes using invoker's rights. In SQL*Plus, log in to the database as a user with the necessary privileges. In SQL*Plus, log in to the database as a user with administrator privileges. A filter is the use of DBMS_STATS to restrict an Optimizer Statistics Advisor task to a user-specified set of rules, schemas, or operations. The DBMS_STATS.CONFIGURE_ADVISOR_OBJ_FILTER function creates a rule filter for a specified Optimizer Statistics Advisor task. The function returns a CLOB that contains the updated values of the filter. The DBMS_STATS.CONFIGURE_ADVISOR_RULE_FILTER function creates a rule filter for a specified Optimizer Statistics Advisor task. The function returns a CLOB that contains the updated values of the filter. The DBMS_STATS.CONFIGURE_ADVISOR_OPR_FILTER function creates an operation filter for a specified Optimizer Statistics Advisor task. The function returns a CLOB that contains the updated values of the filter. Filters are useful for including or excluding a specific set of results. For example, you can configure an advisor task to include only recommendations for the sh schema. Also, you can exclude all violations of the rule for stale statistics. The primary advantage of filters is the ability to ignore recommendations that you are not interested in, and reduce the overhead of the advisor task. Use this procedure to include or exclude the specified database schemas or objects. The object filter takes in an owner name and an object name, with wildcards (%) supported. Use this procedure to include or exclude the specified rules. Obtain the names of rules by querying V$STATS_ADVISOR_RULES. Use this procedure to include or exclude the specified DBMS_STATS operations. Obtain the IDs and names for operations by querying DBA_OPTSTAT_OPERATIONS. For the preceding functions, you can specify the type of operation to which the filter applies: EXECUTE, REPORT, SCRIPT, and IMPLEMENT. You can also combine types, as in EXECUTE + REPORT. Null indicates that the filter applies to all types of advisor operations. Include findings for all objects (by default, all objects are considered), and then exclude findings for specified objects. Exclude findings for all objects, and then include findings only for specified objects. You must be the owner of the task. In SQL*Plus or SQL Developer, log in to the database as a user with the necessary privileges. Either exclude or include objects for a specified task using the DBMS_STATS.CONFIGURE_ADVISOR_OBJ_FILTER function. report is the CLOB variable that contains the returned XML. tname is the name of the task. opr_type is the type of operation to perform. rule is the name of the rule. owner is the schema for the objects. table is the name of the table. action is the name of the action: ENABLE, DISABLE, DELETE, or SHOW. Log in to the database as sh. Drop any existing task named opt_adv_task1. Create a procedure named sh_obj_filter that restricts a specified task to objects in the sh schema. Create a task named opt_adv_task1, and then execute the sh_obj_filter procedure for this task. Enable all rules (by default, all rules are enabled), and then disable specified rules. Disable all rules, and then enable only specified rules. Obtain the names of the advisor rules by querying V$STATS_ADVISOR_RULES. Either exclude or include rules for a specified task using the DBMS_STATS.CONFIGURE_ADVISOR_RULE_FILTER function. In this example, you know that statistics are stale because the automated statistics job did not run. You want to generate a report for the task named opt_adv_task1, but do not want to clutter it with recommendations about stale statistics. This example is the inverse of the preceding example. You want to generate a report for the task named opt_adv_task1, but want to see only recommendations about stale statistics. Disable all operations, and then enable only specified operations. Enable all operations (by default, all operations are enabled), and then disable specified rules. The DBA_OPTSTAT_OPERATIONS view contains the IDs of statistics-related operations. To query the DBA_OPTSTAT_OPERATIONS view, you must have the SELECT ANY TABLE privilege. Query the types of operations. Obtain the IDs of the operations to be filtered by querying DBA_OPTSTAT_OPERATIONS. Exclude or include rules for a specified task using the DBMS_STATS.CONFIGURE_ADVISOR_OPR_FILTER function, specifying the IDs obtained in the previous step. opr_type is the type of operation to perform. This value cannot be null. opr_id is the ID (from DBA_OPTSTAT_OPERATIONS.ID) of the operation to perform. This value cannot be null. Log in to the database as stats. Create a procedure named opr_filter that configures a task to advise on all operations except those that gather statistics for tables in the hr schema. Create a task named opt_adv_task1, and then execute the opr_filter procedure for this task. Only users with both the ANALYZE ANY and ANALYZE ANY DICTIONARY privileges can perform this task on system-level rules. Users with both the ANALYZE ANY and ANALYZE ANY DICTIONARY privileges can perform this task for all statistics operations. Users with the ANALYZE ANY privilege but not the ANALYZE ANY DICTIONARY privilege can perform this task for statistics operations related to any schema except SYS. Users with the ANALYZE ANY DICTIONARY privilege but not the ANALYZE ANY privilege can perform this task for statistics operations related to their own schema and the SYS schema. Users with neither the ANALYZE ANY nor the ANALYZE ANY DICTIONARY privilege can only perform this operation for statistics operations relating to their own schema. Users can perform this task for any object for which they have statistics collection privileges. If you specify an execution name, then this name must not conflict with an existing execution. This section describes the task name, execution name, creation date, and modification date. This section summarizes the findings and rules violated by the findings. Each finding section lists the relevant rule and findings. If the advisor has a recommendation, then the recommendation is described. In some cases, a recommendation also has a rationale. The name of the automated Optimizer Statistics Advisor task is AUTO_STATS_ADVISOR_TASK. If you follow the automated workflow, then you only need to query the automatically generated report. In SQL*Plus, log in to the database as a user with ADVISOR privileges. Query the DBMS_STATS.REPORT_ADVISOR_TASK function output. exec is the name of the execution. type is the type of output: TEXT, HTML, or XML. sect is the section of the report: SUMMARY, FINDINGS, ERRORS, and ALL. lvl is the format of the report: BASIC, TYPICAL, ALL, or SHOW_HIDDEN. Please refer to the finding section for detailed information. Recommendation:  Do not use SET_[COLUMN|INDEX|TABLE|SYSTEM]_STATS procedures. Gather statistics instead of setting them. Finding:  There are 367 statistics operations using nondefault parameters. Recommendation:  Use default parameters for statistics operations. Finding:  There are 318 uses of GATHER_TABLE_STATS. Recommendation:  Use GATHER_SCHEMA_STATS instead of GATHER_TABLE_STATS. them in the obj_filter_list parameter of GATHER_SCHEMA_STATS. from using the incremental option. Recommendation:  Do not use the incremental option for statistics gathering on these objects. outweighs the benefit of using the incremental option. The DBMS_STATS.IMPLEMENT_ADVISOR_TASK function implements the recommendations for a specified Optimizer Statistics Advisor task. If you do not specify an execution name, then Optimizer Statistics Advisor uses the most recent execution. The DBMS_STATS.SCRIPT_ADVISOR_TASK function generates an editable script with recommendations for a specified Optimizer Statistics Advisor task. The simplest means of implementing recommendations is using DBMS_STATS.IMPLEMENT_ADVISOR_TASK. In this case, no generation of a script is necessary. You can specify that the advisor ignore the existing filters (level=>'ALL') or use the default, which honors the existing filters (level=>'TYPICAL'). result is the CLOB variable that contains a list of the recommendations that have been successfully implemented. filter_lvl is the level of implementation: TYPICAL (existing filters honored) or ALL (filters ignored). Optionally, print the XML output to confirm the implemented actions. Unlike IMPLEMENT_ADVISOR_TASK, the SCRIPT_ADVISOR_TASK generates a script that you can edit before execution. The output script contains both comments and executable code. As with IMPLEMENT_ADVISOR_TASK, you can specify that the advisor ignore the existing filters (level=>'ALL') or use the default, which honors the existing filters (level=>'TYPICAL'). You can specify that the function returns the script as a CLOB and file, or only a CLOB. exec is the name of the execution (default is null). dir is the name of the directory (default is null). If you do not specify an execution name, then Optimizer Statistics Advisor uses the most recent execution. -- report for more details. -- the report for more details. -- Rule Description: Statistics should be maintained incrementally when it is beneficial. -- Turn on the incremental option for those objects for which using incremental is helpful. -- Unlock statistics for objects that are not volatile. -- Lock statistics for volatile objects. -- Turn off incremental option for those objects for which using incremental is not helpful. -- Turn on auto degree for those objects for which using auto degree is helpful. -- Gather statistics for those objcts that are missing or have no statistics.